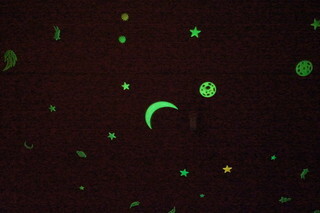 This is my ceiling, just after I hit the switches off at night. This is the sight to which I sleep to every night. It doesn't change depending on the time of the year, nor depending on anything else but it can be quite lovely. It's not a very good shot but I'll re-do this one once the house renovations we are currently having finish.